Seemingly present in every corner and culture of the world, there are many types and subtypes of mint: estimates range from 18 distinct mint types to over 3000 different species. This means that a relationship to the little green perennial is one of the many small things that human beings of all shapes and stripes have in common. Whether we use mint to soothe digestive distress, put it in our toothpaste or muddle it into our meats, mint has been an important part of our lives through the ages. So mighty is mint that even the gods of ancient Greece lay claim to it. Persephone, goddess of the underworld and wife of Hades, was said to have transformed a nymph named Minthe into this resilient little herb as punishment for having attracted too much of Hades' attention. In her new plant form, Minthe spread herself all over ancient Greece and soon (almost) all over the world. Mint is native to Europe, Asia, North America, Australia, and some southern regions of Africa, but it can also be found in South America. A persistent immigrant, mint has found its place in South American cultures and cuisines (consider the outstanding chimichurri sauces of Argentina and Uruguay). While mint is a welcome find in most gardens, it would be ill-advised to simply plant it and leave it anywhere. As it is known for taking over if not given clear boundaries, make sure to plant your mint in a container. A robust herb, mint can be bought and used all year round. It thrives in temperate climates. It will be one of the first plants in any garden to sprout in spring and it will grow under almost any condition (except extreme ones, which is why you won't find it growing in Antarctica). Mint comes in varying shades of green, white, and purple. 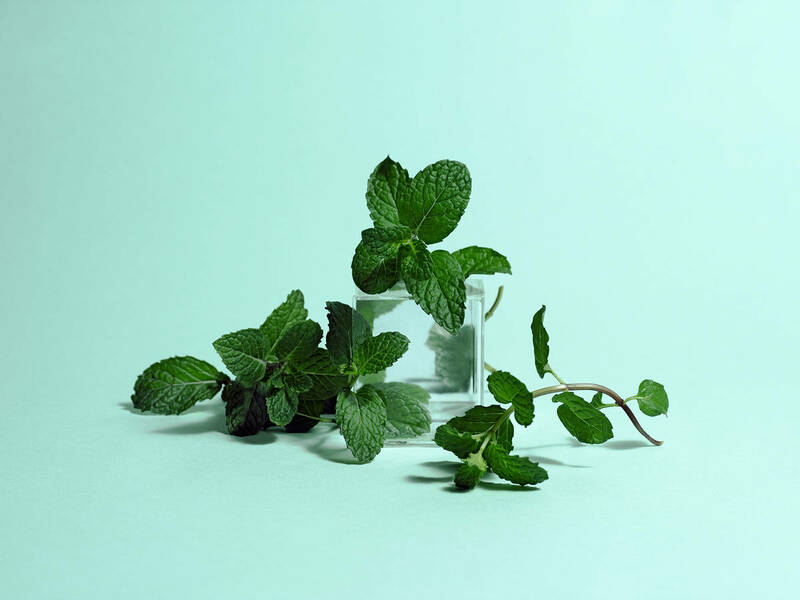 All mints have a few things in common: squared stems and flat, simple, sometimes fuzzy leaves. When shopping for mint, it’s important to know what you will be using it for. Peppermint and spearmint are the most common varieties of mint. Spearmint is better put to use in savory dishes and peppermint, in sweet. Other types include apple mint (aka 'wintergreen'), lemon balm, Corsican mint (for Crème de menthe), and the list goes on. Young mint sprouts are considered the most flavorful, but fully-matured leaves are also fine to use. Before buying any mint, do what is called a 'bruise test.' Squeeze one of the mint leaves between your fingers: Good, fresh mint will release menthol and leave a strong scent on them. In as much as there are endless varieties of mint, there are also many ways to store it. Fresh mint can always be stored in living form as a plant on your balcony or in your kitchen. If your mint is brought home from the market or harvested from outdoors, consider the following tips for storage. Freeze chopped mint in ice cube trays: Wash, dry and chop the mint and fill cube holders. After freezing, transfer the resulting mint cubes to a freezer bag for longer storage. If you want to dry out your mint, tie it in bundles and hang the bundles upside down. Once dry, remove the stems and store the dried leaves in a sealed, preferably glass, container. If you plan to use your mint within a week to 10 days of buying it, trim the leaves from the stems and lay the leaves out flat between layers of paper towels. Then put the layered paper towels into a plastic bag inside the vegetable crisper. Alternatively, store the mint as you would store refrigerated flowers. Trim the mint's stems, remove damaged leaves and submerge them in a container of water. Make sure to change the water every 2 to 3 days. To store for use within a day or 2, just stand the mint sprigs straight up in a glass of water and put it in the fridge or leave it on the counter. If you still have an abundance of mint after all that storing, consider turning your leftover mint into an extract, a pesto, or even a jam. These are all flavorful and creative ways to store this bountiful herb. Mint is deliciously versatile. You can use it in savory and sweet dishes alike. It can be muddled for mojitos and mint juleps, brewed as an infusion, or splashed into lattes. It can be rubbed into lamb, chopped up into tabboulehs, melted into sugar for hard candies or blended into a smooth chocolate mousse. Mint can be turned into a garnish for rices, soups, noodles, and curries, used as main ingredient in a Thai salad, or as flourish in lumpia. For a simple treat, dip clean mint leaves in melted chocolate, lay them out on wax paper and serve as after dinner mint. We recommend using fresh mint for creating your next dish. Discard the stems and stack cleaned leaves one on top of the other then roll the leaves into a bundle for easy chopping.